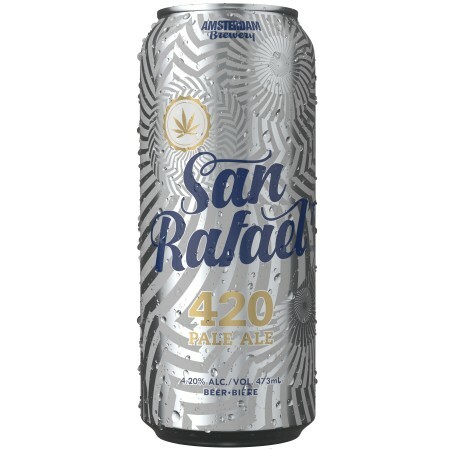 MARKHAM, ON – Medical cannabis producer MedReleaf has announced the release of a new “cannabis-inspired beer” that serves as preview for the San Rafael ’71 brand of recreational cannabis products it intends to introduce to the Canadian marketplace once legalisation goes into effect later this year. Our award-winning team created a flavour profile using a unique blend of citrus and summit hops and specialty malts that gives a nod to the cannabis experience with peach and pine aromas giving way to spice and mild bitterness. 4:20 Pale Ale is available now in 473 ml cans at and Beer Store locations and both Amsterdam retail stores, and on tap at select bars in Ontario. An official launch party will take place on Thursday February 22nd at The Opera House (735 Queen St. E., Toronto), featuring live sets by cover bands Eat A Peach (Allman Brothers Band) and Mob Barley and The Railers (Bob Marley), and a free 4:20 Pale Ale for the first 200 guests. For more details, see the San Rafael ’71 website.